GTA IV has officially been released! I went to a midnight launch in a small Melbourne store. I arrived at 11:30pm and there was only 4 people there. I went to get some food and when I returned 15 minutes later, there was a line with 25 people. Once the clock hit midnight, the line moved rather quickly and I had my pre-order soon after 12. I played until around 4am and then I went to sleep since I had an 8:30am class that I couldn't miss. I heard that some other stores in Melbourne gave out prizes and had lines with 150 or more people. I just wanted to get GTA IV home as quickly as possible. During the war, we did some bad things and bad things happened to us. I was very young and very angry. Maybe that is no excuse but I need money, this pays and I'm good at it. The creature that could do this doesn't have a soul. Island Hopper - A rather large map consisting of three islands and a gang system. Tower Arena - A small map in which players start on a tower to prevent spawn killing. SWAT - A map with a maximum wanted level of 4. The Rock - A tiny map consisting of a large rock. Scavenger - A small map with only rocket launchers; each giving you only one rocket. Capture the Van - A map in which all players try to steal a car and bring it to their crusher to earn points. Fortress - A map in which all players try to be the only one inside the fortress to earn the most points. Rockstar explains the tech behind GTA4, with new screens. How Rockstar managed to put San Andreas in the rearview mirror and make its most ambitious game to date. 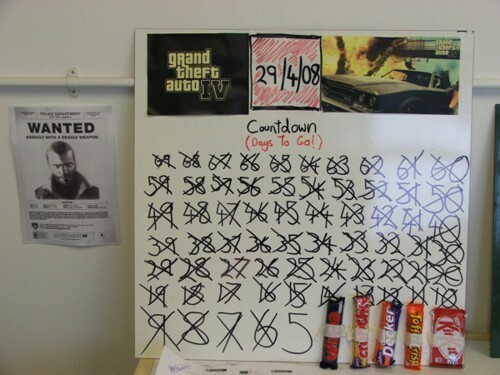 Are you as hyped for GTA IV as this guy? Run wild with 16 people and bring Liberty City to its knees. You begin in a standoff with the other players. Everyone spawns in a circle and there is, at least the first time you play Free Mode, a brief moment of surprise when no one does a damn thing. This lasts a few seconds before someone takes out a gun and shoots their neighbor in the face. But this standoff isn't just to start the killing (and jump people around the city with their first respawn); it also allows players to talk about what they want to do in Free Mode. + Wounderful environment with gajillions of great things to do. + Multiplayer is a deep, terrific addition to the series. - Would be even better with a little editing: it starts slowly, has a few too many “filler” missions. Both reviews have quite a few mission and story details, and even include achievement details, Easter-egg details, and more. Be sure to check them out whenever you see them at your local shop. Rockstar recently held a GTAIV multiplayer event at the Microsoft offices in Sydney and were very keen to show off their modes for GTAIV Multiplayer, so let’s get into it. There were only six or eight of us nosey nerds at the event that day. We each sat down to our own Xbox 360 which were linked via Xbox Live to each other. At first I thought we were connected locally which goes to show how well the net code of GTAIV stood up. They got to try 3 multiplayer modes: Death Match, Race and Cops N’ Crooks. Check australiangamer.com for more information. The PS3 version of GTA IV is in some Australian stores right now. An employee got his hands on it and took some pictures of the contents. It does not officially go on sale until midnight, April 29.